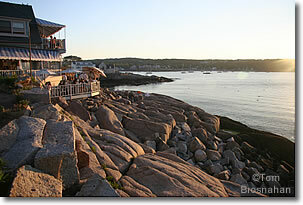 It's easy to reach the North Shore and Cape Ann, north of Boston, by car or train, possible by ferryboat and bus. The Cape Ann towns of Manchester-by-the-Sea, Gloucester and Rockport, and the North Shore towns of Essex and Ipswich, are served by highways, MBTA Commuter Rail trains, and ferries from Boston (map). CATA local buses and the Ipswich-Essex Exploreconnect these towns. Follow Interstate 93 (I-93) north from Boston to I-95 North, the MA Route 128 North to reach Manchester-by-the-Sea, Essex, Ipswich, Gloucester and Rockport (map). If you tire of the highway, exit MA Route 128 for Manchester-by-the-Sea and follow the scenic alternative: MA Route 127 north. Sunset dining at Rockport MA.